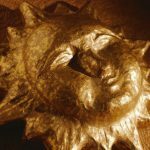 Sun and son are homophones – they happen to have the same pronunciation, but their spellings are different, and their meanings and origins are unrelated. Germanic, Latin and Greek have all contributed to our vocabulary connected with the sun. Germanic has provided sun itself, plus the name of the day of rest, Sunday. 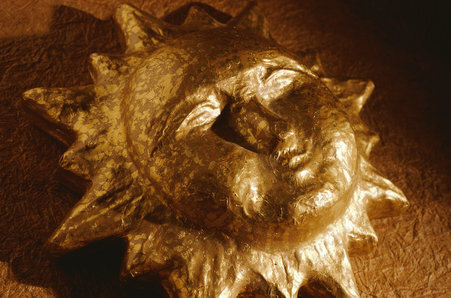 Sun also forms quite a number of other compounds, such as sunbathe, sunbeam, sunburn, sundial, sun-dried and sunshine. From our terrestrial perspective, the sun appears to circle the earth, traversing the sky during the course of each day before going down below the western horizon in the evening and eventually reappearing each morning in the east – hence our words sunset and sunrise. From Latin we get the adjective solar, which appears in, for example, solar system, solar cell, solar panel and solar power, as well as in solarium. And from the same origin we have the summer solstice and winter solstice, the two days of the year when the sun, having reached its maximum distance north or south of the equator, stands still (‘-stice’ is related to ‘stand’) for a moment before heading back in the opposite direction. The sun was brought to a more permanent standstill by Mikołaj Kopernik (1473-1543, known internationally by his Latinised name Nicolaus Copernicus). The inscription on his statue in Toruń, Poland, tells us that he stopped the sun and the heavens in their tracks, and set the earth in motion. He performed this feat by proposing his heliocentric model of the solar system – one with the sun (Greek helios) the centre, and the earth and the other planets revolving around it, in distinction to the the long-accepted view that the earth was the stationary centre of the universe. The element helium is so named because it was first discovered in the sun‘s spectrum during a solar eclipse in 1868. Heliotrope is a plant whose flowers turn to face the sun’s rays (or, in fact, any source of light). The sunflower is also often, but wrongly, thought to be heliotropic (‘tropic’ = ‘turning’). Its name is due rather to its visual resemblance to the sun, and the flowers actually orientate themselves permanently towards the east. The Copernican Revolution hasn’t altered our perception of the sun‘s daily progress across the sky, and even off-duty astronomers, in casual conversation – while sunning themselves in their gardens or on a beach, perhaps – probably refer to the sun rising and setting. And before Copernicus, there had in fact been quite a number of earlier heliocentric theories, dating right back to the Ancient Greeks – evidence that there’s really nothing new under the sun!